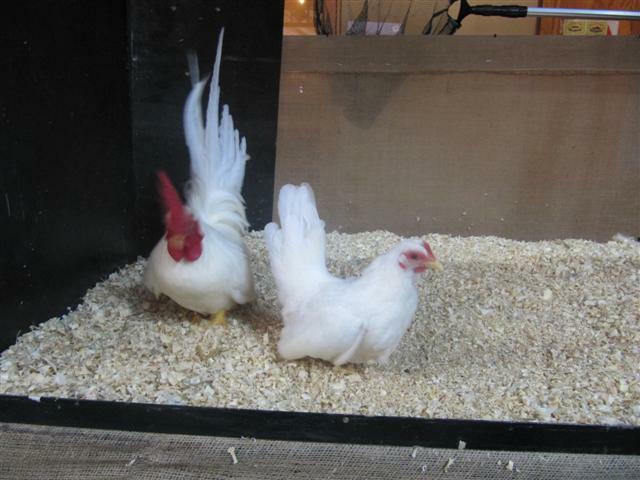 The Japanese Bantam, also known in many parts of the world as Chabo, is a breed of chicken originating in Japan. The Chabo with its large head and comb, a very large upright tail, very short legs and shuffling gait is certainly a bantam to draw attention. The wings angle down and to the back along the sides. Somebody called it “the little Grotesque”. They are a true bantam breed. The Chabo has graced the gardens of the Japanese aristocracy for well over 350 years. Historical evidence suggests that the Japanese Bantam originated in Southeast Asia, where it is still raised today. They enjoy a high degree of popularity in Malaysia, and are very common in Java, which is now part of Indonesia. Japanese Bantams began to appear in Japanese art around the year 1635, right about the time Japan closed its shores to outside trade. It also appears in Dutch art of the same era. This suggests that Dutch spice traders probably carried the Chabo as gifts to the Japanese from the Asian spice ports, such as Hoi An (Vietnam) and likely from Java, which part of Dutch colonial area on that time. The very word “chabo” originates in Java as chabol (Cebol), where it means “dwarf” and applies both to humans, and to the short-legged Chabo chicken. In Japan, the word would drop the “L,” as no speaker of Japanese would be inclined to pronounce it.True bantams of great antiquity, it is without counterpart in a large breed.